The Pope pointed out that wisdom is a daily thing that comes from reflection on life and from stopping to think about how one lives. The Pope said, “do not follow your instincts, your strength, indulging in the passions of your heart.” All have passions, but one must be careful and dominate them. Passions, the Pope said, are not bad things, but they need to be managed. They are like blood that helps do many good things but if you are not able to dominate them, they will dominate you, the Pope warned. The Holy Father drew attention to the relativeness of life. We are not eternal, we cannot think of doing whatever we like, trusting in the infinite mercy of God. So don't be rash and reckless and believe that you will get away with it. You may get away with it once but you don’t know what’s next. Don't say: "God's compassion is great, he'll forgive me my many sins", and so I continue doing what I want. 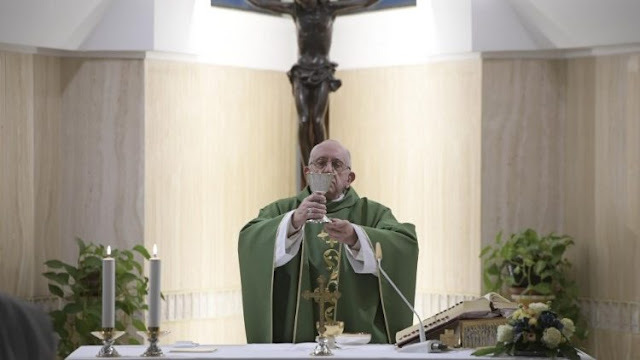 Regarding this, the advice of the father or grandfather is: "Don’t wait to convert yourself to the Lord, don’t postpone it from day to day because the anger of the Lord will suddenly burst forth," the Pope warned. Let’s take a little time every day to examine our conscience, to convert to the Lord, the Pope urged, without it off for tomorrow. Try to not to let it happen again and if you manage to control yourself and not be controlled by your passion, perhaps it may happen less. But no one is sure of how and when our life will end. Five minutes at the end of each day, the Pope said, will help us think about a change of heart and conversion to the Lord, without procrastination.